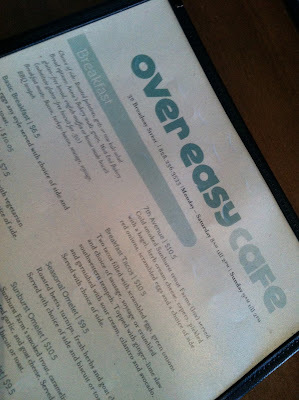 For our second breakfast in Asheville, we walked from our hotel to the Over Easy Cafe. I wanted to eat there because of their dedication to seasonal menu items, as well as local sourcing. Their eggs and all meats/proteins are organic, antibiotic, and hormone free. That said, you need to be prepared for a leisurely meal at Over Easy! The place was packed full of people, and their kitchen staff had their hands full. 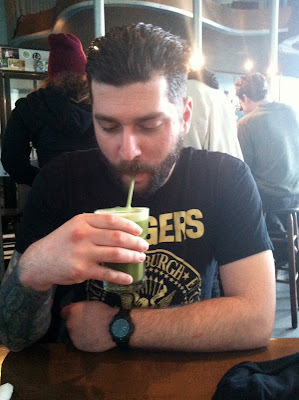 Duke had a green juice concoction that I didn't venture to try, but which he enjoyed a lot. I had some fresh-squeezed orange juice that tasted fantastic. Then we waited. And waited. It took probably half an hour to get our food, since the kitchen is about the size of the one in my apartment! But once we got our food, it was worth the wait. And if gave us plenty of time to stare at the local artwork on the walls! I had a croissant sandwich and home fries, while Duke had the French toast with fruit. I tried a little of everything, and it was fresh and fantastic.